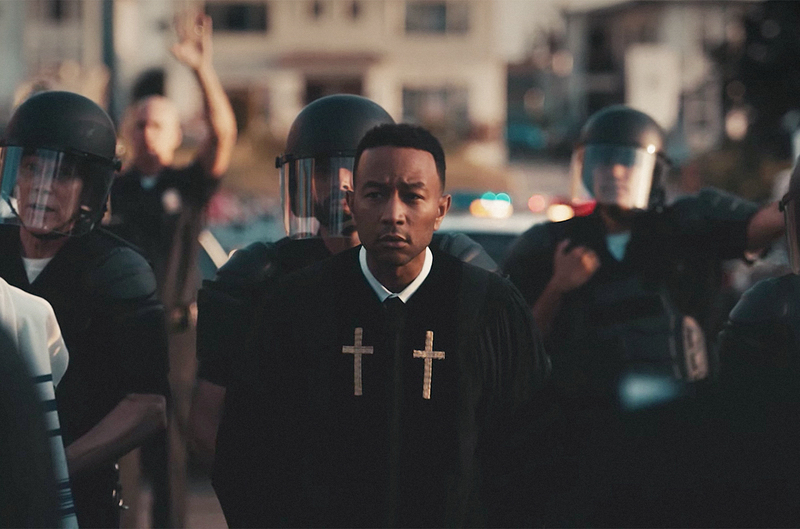 John Legend released a powerful video for his latest single “Preach” on Friday (Feb. 15).The visual, which opens with the EGOT winner in bed next to wife Chrissy Tiegen, tackles a multitude of hot-button topics in the often fraught, politically-charged landscape of 2019 including mass shootings, police brutality against unarmed black men and family separation at the U.S. border. “And heaven knows I’m not helpless/But what can I do?/Can’t see the use in crying/If I’m not even trying to make the change I wanna see,” Legend sings in an abandoned church, urging listeners to shake off the apathy that can so often overwhelm in an era of constant tragedy and fake news. The music video also breaks new ground as the first to employ YouTube’s new donate/fundraising feature. Using the hashtag #CantJustPreach, fans can spread the video’s message on social media and donate to FREEAMERICA, the nonprofit launched by Legend to reform the criminal justice system with the goal of ending mass incarceration. The campaign aims to raise $50,000 in the next year.Download and watch full video for “Preach” below and share your thoughts on it in the comment section below.